She's an IT girl during the day, blogger by night, and events curator in between while also finishing her Mass Communication degree. 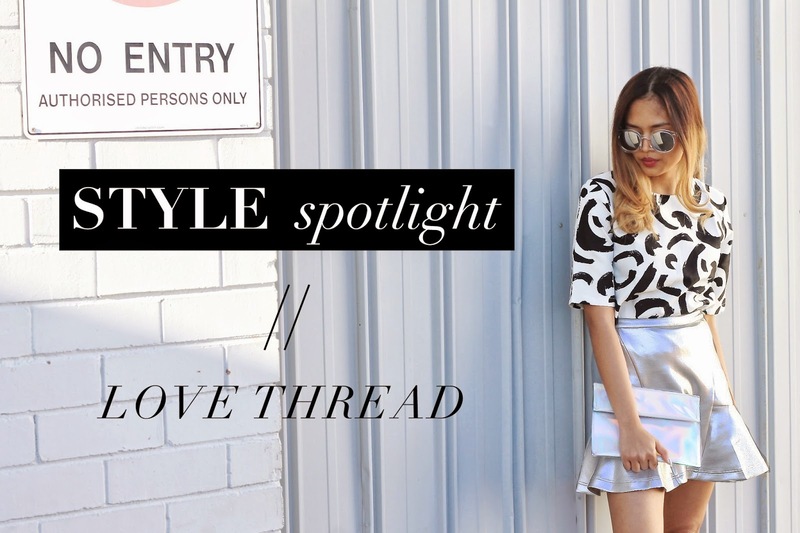 Meet Angeline from Love Thread, we've been crushing on her style since she made her online debut in 2013. A romantic at heart, this girl is guaranteed to give you major fashion and food envy with her bright, pretty and scrumptious posts on Instagram. Her bubbly personality and feminine yet edgy style has quickly gained the attention of labels around WA and Australia, which further cemented her role as one of Perth's hottest fashion influencers with her most recent nomination for the 2015 WA Fashion Award for Best Blogger. Angeline caught up with us this week at HELLO PARRY HQ to chat about our most recent collaboration #helloparryxlovethread Valentine's day edit, her love for Sunday Brunch and Love Thread Project. Congrats on your nomination for Best Fashion Blogger for the WA Fashion Awards! In only a short amount of years you've managed to carved your way in the fashion scene, how did it all start? Thank you so much! I'm still pinching my self that I got nominated. It was a total shock. I actually didn't find out about it until my friend wrote on my Facebook to congratulate me. It's so crazy to see what started as a University project back in 2011 to be where it is now. I had to build a blog or a website about my interest/hobby for my Media class, I was crushing on Gary Pepper Girl at the time, so I decided to do a fashion/style blog. These days though my blog serves as an online diary of love & life/style. A platform where I share my fashion muses, pretty things that inspire me & my obsession with dressing up myself and others. Your photos are always so bright and colourful, so are your outfits. Where do you draw your inspirations from? I'm a lover of all things pretty, you know things that makes you go 'oohh.. or aaahhh'. Nature and sunset takes the top spot, also Disney movies or characters and crazy prints. I'm also a huge fan of street style goddesses in the likes of Gary Pepper Girl and Miroslava Duma, They're my daily inspiration when it comes to my outfit choices. We live in a world that is constantly trying to make us something else, through fashion I feel like I can express my self and my creativity. I love dressing up and put together things that may not seem to work but with the right accessories and a dash of creativity, I've created my own piece of art. Definitely between 1950s to 1960s. I love the hair, dresses, shoes and style! I did a 1950s inspired garden party last year and it was a hit! Tickets were sold within a week and the ladies all wore the most beautiful dresses. We're super jealous of your food posts! Where's your favourite brunch spots in Perth? Definitely Sayers in Leederville, Sapore Espresso Bar in Belmont and Piccolo's Corner in West Leederville. Oh and if you ever find yourself in the South West, Margaret River Bakery is definitely a must try too! I love online boutiques, I can spend hours browsing through different ones. ASOS, Missguided, Lady Luna Boutique and of course Hello Parry is my favorite at the moment. Do you have anything you've got your eyes on our website? Oh plenty!! I love the Grecian off-shoulder top that I wore for the Valentine's day edit, the Azalea Floral Applique Clear Clutch and all the pearl collections. Wearing Izabel Grecian Off-Shoulder Savi Lace Cut Out Pencil Skirt, Azalea Floral Applique Clear Clutch, Double Pearl Choker Necklace and Simone Mini Double Pearl Cuff Bracelet. You call yourself a romantic at heart, do you normally go all out for Valentine's day? Usually yes, my husband used to plan elaborate dates and send me ridiculous flowers (which I adore!) on Valentine's day. As the relationship progresses I slowly noticed that less flowers were delivered to the office every year! Now that we're married we don't really lavish on things like that anymore(much to my dismay). We tend to save for that "special date", which can go for 2-3 weeks. So our next date is to Japan, the trip is to celebrate our 2nd wedding anniversary and 8 years of being together! I can't wait! You do a lot of charity work/events and donate your blog profits to great causes. Hello Parry sponsored one of your events, Pretty in Pink Girls Night, last June. Tell us the idea behind your charity work. Yes, Pretty in Pink was such a great night, thank you guys so much for helping out! Well last year I started @lovethreadproject, a side project of mine which supports non-profit organisations focused on helping children, youth and women at risk. 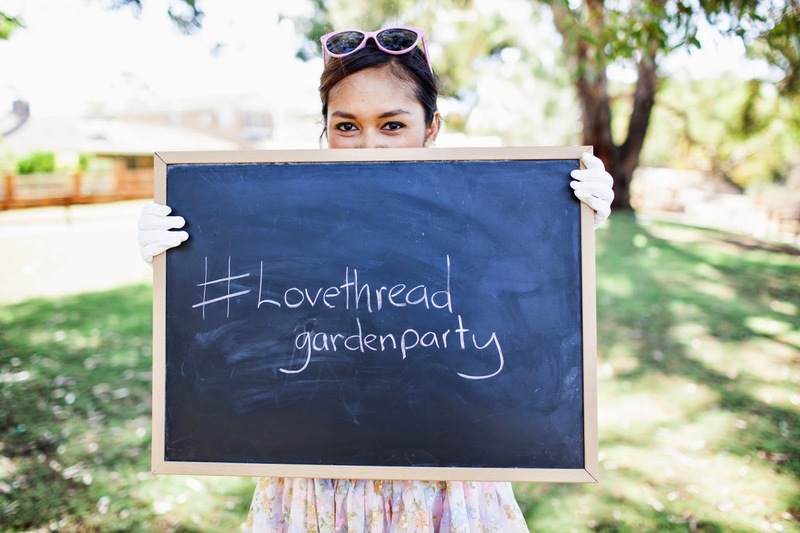 @lovethreadproject aims to support the charities through events, garage sales and all profits from Love Thread blog. My first project was with The Esther Foundation, we raised awareness and much needed funds for young women at risk in my hometown Perth. Ever since I was young my dream is to make a difference in the world. I want to have my own orphanage or foundation where I can share love and help out those in need. I wasn't sure how I could achieve this, but I knew that's what I wanted to do. I never have imagined my blog to be where it is now, but I'm grateful for every opportunities that I've got. I see the potential of this little blog and I thought to my self that I can actually make that dream a reality. One step at a time. Thanks so much Angeline for taking the time to chat with us. We're so excited to see the events you'll throw this year, we'll definitely be there with bells on! Follow Angeline and her blog Love Thread. Also vote for our WA friends, vote for Love Thread to win Best Fashion Blogger at WA Fashion Awards. You can do so by clicking here.